Product information "Anti-Ribosomal Protein S3 (human), clone RP159-1"
Recognizes human ribosomal protein S3. 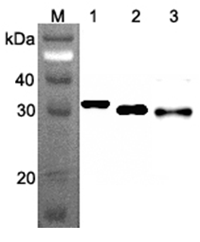 Detects a band of about 32kDa by Western blot. Liquid. 0.2µm-filtered solution in PBS, pH 7.4. Contains no preservatives. RpS3 is a component of the 40S ribosomal subunit and is an an essential but previously unkown subunit of NF-kappaB involved in the regulation of key genes in rapid cellular activation responses. RpS3 interacts with nm23-H1. The expression of rpS3 reduces the secretion of MMP-9 and the invasive metastatic potential in HT1080 cells. The phosphorylated ERK is reduced by the expression of rpS3. Immunogen: Recombinant human ribosomal protein S3. Customer review for "Anti-Ribosomal Protein S3 (human), clone RP159-1"